Welcome! It’s a real pleasure to have you here today! Today I get to share with you my living room decorated for Christmas! 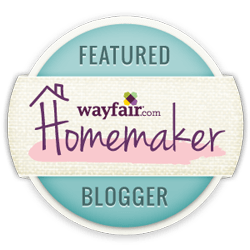 I have joined some incredibly talented bloggers, Hometalk.com and Country Living.com to bring you the Home for Christmas series! In this series, you will find a variety of everything Christmas! Please be sure to visit the other links linked up at the bottom of this post! If you follow me on Facebook and Instagram, you know I shared that my 4 year old daughter decorated our Christmas tree this year! I added less than a dozen of pieces myself, so this is all her work! I typically let the kids decorate the tree and then “rearrange” it while they’re sleeping (I’m not the only one, right?). Well, this year she did such a fabulous job (I’m still very impressed!) that I decided to keep it just as it is! This year I opted for a Winter Wonderland design! Natural accents, neutral tones, faux fur and tons of glitter!! It truly creates a comfy home for Christmas! Now, let’s get to it.. I’m so tickled to share my home with you all this Christmas! Thank you so much for stopping by and checking out my living room decorated for Christmas! I hope that you will stop back soon, I will be sharing more of my home with you! Lovely home, I am drooling over those stockings! Your holiday decor is so pretty! I love your stockings! Your Christmas decor is fabulous! I love the gold with white (those are my colors too). Beautiful done. Thank you Vanessa!! I’m loving these colors this year! Beautiful! And your daughter did a great job! Thank you so much Dawn! She’s my mini me, and I couldn’t be more impressed 🙂 It was great to have you here today!! You are so sweet Meegan! Thank you very much for your kind words, they really made me smile!! It was a pleasure to have you here, please come back soon! This xmas tree is breathtaking! totally amazing! So glad I find you! Machi from Greece!